The ILO report’s release came the day after the United Nations Independent Expert on foreign debt and human rights published new Guiding Principles on Human Rights Impact Assessments of Economic Reforms to assist stakeholders in assessing the impact of economic policies and ensuring that these are anchored in human rights standards. [OHCHR] According to the Independent Expert, “The thrust of the Guiding Principles is that States cannot shy away from their human rights obligations in economic policy making at all times, even in times of economic crisis.” [OHCHR] Both publications reflect broader efforts at the international level to advance labor rights and the progressive realization of economic, social and cultural rights in a comprehensive manner that is centered in human rights. The ILO’s Global Commission on the Future of Work identifies expanding youth populations in some regions and aging populations in others as an emerging global challenge that is likely to significantly impact the future of working life. See ILO, Work for a Brighter Future at 18-21. By 2050, the ILO projects that almost all parts of the world will see a sharp increase in the percentage of the dependent population (individuals aged 0-14 and 65+). See id. at 19. Many countries have a quickly aging population, which is expected to place an increased burden on social security and healthcare programs, while the other countries are seeing expanding youth populations, which may increase youth unemployment and migratory trends. See id. at 18. To address these trends, the ILO projects that by 2030 the global economy will need to create 344 million jobs in addition to the 190 million jobs necessary to address current global unemployment. See id. at 20. The report also focuses on the impact of innovations in technology and automation on future workforces. The Commission highlights studies showing that almost half of workers in the United States are at risk of having their current employment replaced by automation, over half of the jobs in South East Asia are at risk of automation in the next 20 years, two thirds of jobs in the developing world are vulnerable to automation, and that nearly 50 percent of companies expect that automation will reduce some of their full-time workforce by 2022. See id. at 19. Although automation will likely create new jobs, the Commission believes that those likely to lose their jobs in the transition will be the least equipped to take advantage of new opportunities because they will not have the skills that the digital economy will demand. See id. at 18. In addition to automation, the emergence of “crowd-working websites” and “app-mediated work” risk creating regressive working practices for an entire generation, which the Committee, borrowing from Angela Merkel, described as “digital day laborers.” See id. Further, the Commission notes that adequate responses to the risks of climate change, which disproportionately affects vulnerable populations, rural economies, and low-income countries, will also have a significant impact on labor markets. See id. at 18, 47. The ILO projects that implementation of the Paris Climate Agenda will lead to an estimated global job loss of around six million. See id. at 19. These emerging trends will only add to a significant number of current labor challenges, such as rates of global unemployment in the hundreds of millions, the two billion people working in informal employment, the 300 million workers living in extreme poverty, and the 2.78 million people suffering from fatal work-related injuries and illnesses, among other issues. See id. at 18, 20. 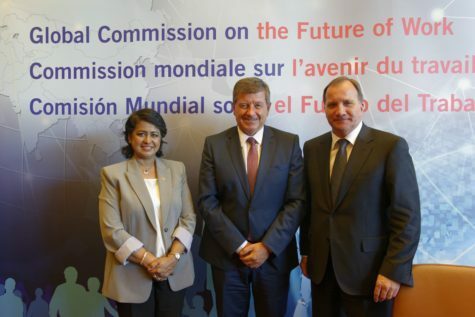 Despite these challenges, the Commission is optimistic about the future, anticipating that “countless opportunities lie ahead to improve the quality of working lives, expand choice, close the gender gap, [and] reverse the damages wreaked by global inequality.” See id. at 21. The Commission’s proposed solution involves a fundamental “reinvigoration” of the social contract. See id. at 10. The Commission identifies a need to ensure that the working population receives a fair share of the economic growth and that there is respect for the rights of working people, including social protections against risk. See id. The Commission’s report focuses on three specific areas where States can implement these aims. See id. at 11. The Commission’s first overarching recommendation is that States significantly increase investment in people’s capabilities to participate in an evolving labor market. See id. at 11. To achieve this recommendation, the report proposes establishing a universal entitlement to lifelong learning, increasing support for those transitioning between careers, establishing social policies to achieve gender equality, and ensuring a strong social security program that covers individuals in all stages of life. See id. at 11-12. The Commission’s second set of recommendations urge States should work to improve the institutions of work—the “building blocks of just societies.” See id. at 38. The report proposes establishing universal labor guarantees that set a baseline for the arrangements between workers and employers. See id. These guarantees include establishing a “living wage” guarantee, maximum limits on working hours, and worker health and safety guarantees. See id. at 12. Additionally, the report notes the need for improving work/life balance, guaranteeing the right to collectively bargain, and ensuring that the implementation of artificial intelligence takes a “human-in-command approach.” See id. at 12-13. The Commission’s last overarching recommendation is that States increase investment in decent and sustainable work. See id. at 13. Drawing from the UN 2030 Agenda for Sustainable Development, the Commission emphasizes the need for job creation in areas that are both economically and environmentally sustainable, and that favor human development. See id. This includes the development of rural economies, where the future of many of the world’s workers reside, and related physical and digital infrastructure improvements. See id. Importantly, the Commission stresses the need to reshape business incentive structures to encourage long-term investments and to ensure that companies are held accountable for the impact of their activities on the environment and communities. See id. at 49. Similarly, the new Guiding Principles provide clarity on how to advance economic policies in a manner that upholds States’ human rights commitments, following the UN Independent Expert’s findings that economic reforms can have a negative effect on human rights, especially in cases where economic policies are enacted in response to economic crises. See Report of the Independent Expert on the effects of foreign debt and other related international financial obligations of States on the full enjoyment of human rights, particularly economic, social and cultural rights, UN Doc. A/HC/40/57, 19 December 2018, paras. 1-4. The Independent Expert calls for the use of human rights impact assessments as a tool for all levels of government and institutional actors to assess how economic policies comply with their human rights obligations. See id. at paras. 5-9. The ILO is a specialized agency of the United Nations with 187 Member States. See ILO, About the ILO. The role of the ILO is to oversee compliance with international labor standards, develop labor policies, and devise programs that promote decent work. See id. For more information on the Independent Expert on Foreign Debt and Human Rights, the ILO, or Economic, Social, and Cultural Rights, visit IJRC’s Online Resource Hub. To stay up-to-date on international human rights law news, visit IJRC’s News Room and subscribe to the IJRC Daily.